A wedding day is filled with moments. Big moments, such as the first kiss, cutting of the cake and the first dance. Then there are the smaller moments, like when the groom sees the bride for the first time or when the guests greet the newlyweds with confetti. Every wedding photographer for the last 100 years has known to capture these moment, but the ones that I find make the best photos are actually the smaller moment between moments. Take this photo as an example, I'm sure at the time there were many different things happening in numerous different parts of the wedding, but good documentary wedding photography is all about looking for the little details that otherwise get missed. This wedding took place in October which meant one thing - Halloween! 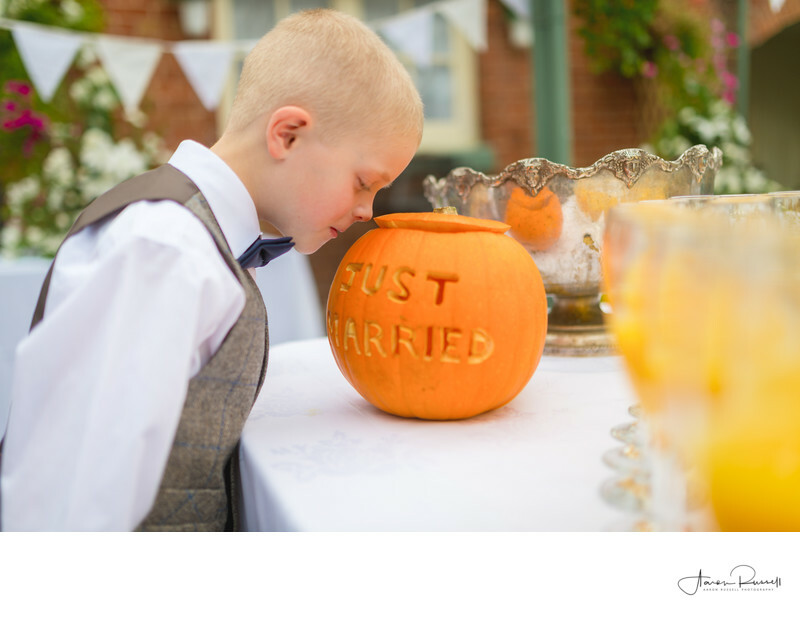 There was a bit of a halloween theme at the wedding but the main centrepiece was this perfectly carved pumpkin with the words 'just married' written on the side. I could see this young boy walking around the quieter parts of the venue, inquisitively and instinctively looking at everything, taking everything in that he could and wanting to experience everything. I kept my distance and with a long lens, quietly took photos without him realising. I saw him approaching the pumpkin and waited for him to take a look inside, slowly bending at the waist to make sure his head was at the right eye-height to get the best view. I took a couple of snaps and just like that the moment was over!